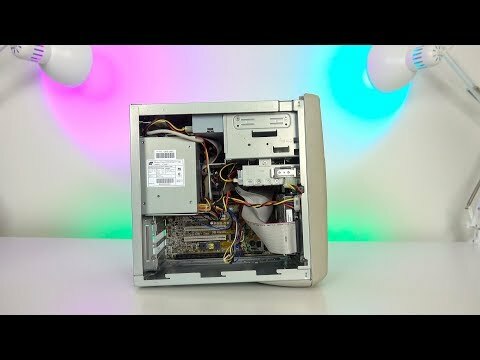 This PC was bought in 1999 for $750. Here’s How It Holds Up In 2017. I Bought this PC For $750 in 1999. I used it for 4 years until 2003. Here’s How It Holds Up In 2017. If you’re around my age, you may remember the late 1990s, a golden age in consumer computing. This was an exciting time where Moore’s law meant more than just double the number of transistors on a chip, it physically translated to double the clock speeds on processors. This meant that computers back then became exponentially difficult to use without upgrades, every 18 months. And the dramatic decrease in price from each iteration would mean you had little time to make your investment in a computer worth it. This Micron Electronics Millennia P200 Plus had a 200 MHz Pentium processor, 64 MB of RAM and 4 GB hard drive for $4249 in 1996. 3 years later in 1999 a similarly specced PC, with a faster 350 MHz processor, lesser 32 MB of RAM, and also a 4GB hard drive went for $750, literally 1/5, or 20% the price of 3 years prior. In my memory, this was one of the most exciting times to be a computer enthusiast, but a bad time to be a teenage kid who couldn’t afford new things every couple months. This Hewlett Packard Pavilion 4530 was THE computer I rode out the 1990’s with. Bought on June 20, 1999, it was complete with an AMD K6-2 processor running at 350 MHz, 32 MB of RAM, a 4GB hard drive, and SiS integrated graphics, which shared 8 MB of system RAM to render the display. This would be the main workhorse of some of my teenage years. Even already at the time, this was a low-end machine. The HP Pavilion line featured 4000, 6000 and 8000 models. Ones starting with a 4 were the low budget end and models beginning with an 8 were the highest end. There was a difference in size of the towers in the higher end models. The front of this PC features a simple design, but unfortunately the floppy drive is built in to the case. There is a 32x CD ROM drive, no CD-R or CD-RW capability, and the door underneath exposes a 3.5” bay. Awkward, as you’d maybe hope you could fit another CD-drive underneath, but nope. On the back of this computer, maybe only half of the connections appear in today’s machines.. Aside from the Ethernet port, 3-pronged power, sound module, and MAYBE the PS/2 ports for mouse and keyboard, you wouldn’t be caught dead with USB 1.1, Serial, Parallel, VGA, telephone jack, and DA-15 game port that was used for Joysticks and game controllers. The internals of this computer are really cramped when compared to today. I understand this is a minitower, but this case stands at 12.5” tall, quite a difference from the 23” of the HAF 932 in a PC I built in 2010, it’s the most snug fit you can have for this ATX motherboard. The main hard drive was mounted on the front this way. It’s an ok use of space, I guess. When you look at this configuration, you’ll see that only the expansion slots are easily accessible without removing the 100W power supply. In the expansion slots, you would only be able to find these PCI slots and 1 ISA slot. PCI, not PCI-express. These slots have a maximum data rate of 133 MB / sec, which is about the average transfer speed of these USB hard drives. The cutting edge for graphics cards at this time was the Advanced Graphics Port, which had 1, 2, 4 and 8x variations, but since this is a low end PC, that slot is absent. When we remove the 100 W power supply, we find the hilariously small cooler master CPU cooler, 3 slots for RAM. The CPU is the AMD K6-2 running at 350 MHz and in AMD’s Socket 7. Released in May 1998, it was supposed to be the lower cost competitor to Intel’s Pentium 2. On a 250 nm process (which is 18x larger than 2017’s Kaby Lake processors), we had a CPU that quickly became budget grade to compete with Intel’s Celeron processors. Wasn’t a fair comparison in my opinion, but fortunately for AMD, the K6-2 was a commercial success and helped lead the way for the Athlon line of processors, which were the first to hit 1 GHz, literally 8 months after I bought this PC. In February 2000. One of the perks of this processor was the use of PC100 SDRAM, meaning it ran at 100 MHz. I upgraded the base from 32 MB to 192 MB back in 2001. Oddly, but maybe not that surprising, there isn’t much else to the internals of this PC. It’s pretty boring really. Maybe one thing of interest is in this side panel that swings out. When we turn on the computer, that pristine vacuum cleaner-like sound immediately fills the room. Computers were notorious for being loud in the 1990s. If you didn’t like it, too bad. At the familiar old Windows 98 loading screen, we have the fantastic sound of nostalgia… And one of my favorite songs ever, the soundcheck for the HP system. Aside from all the quirks of Windows 98 that makes this distinctly 1990’s computing, including the sounds, themes, screensavers, 16-bit color, 800×600 resolution, there’s quite a few barriers in this system that completely isolate it from today’s real computing environment. Most of these have to do with things we take for granted today. One of the biggest barriers is the notion of drivers. In today’s world, we can plug in a USB device and expect it to function within a few seconds. Whether it’s an audio interface or a USB Hard drive, we don’t need to install anything, it just works, it’s native to the OS. That isn’t the case in Windows 98. Anything that’s plugged in must go through a wizard and needs to have drivers installed, maybe from CD, maybe from Floppy Disk, or maybe through Windows Update. But you need to have it installed to work. This is a problem when the ethernet port on the back of this computer is through an expansion card that I lost the driver CD to years ago. Luckily for me though, the drivers are still installed on this PC, so i can access internet through this ethernet port. Which comes to the second problem. In Windows 98, you must configure internet before the computer knows to access it through the ethernet card… But, the worst problem here is the fact that there are very few websites today that work in Internet Explorer 6. That’s right, IE 6. And aside from MSN and Bing, literally no other site loads. Twitter, Facebook, Youtube, Google. Even when I try to look for Firefox, it says my computer specs are below the minimum So… I could install Windows XP on this machine, it does fit the minimum specs. But there’s something unique I can use this PC for. For anyone who runs games released before year 2000, you’ll find that it’s hard to get some of them working on modern hardware. There is a preliminary solution for that in GoG.com, but for games like this Evolva (on GOG), Hexen II, Virtua Fighter II, or one of my personal favorites, an old indie game named Stick Fighters Brawl II by Kevin Reems. The game didn’t even really have proper sound, but written in QBasic, you’d need emulation to run it on modern hardware, whereas it runs like a dream on this machine. There’s a certain feel to these games when run on older hardware. The experience is exactly as I remember it back then. It’s just not the same on modern hardware, even though it is much faster with way more perks, like larger resolutions, ultra wide monitor support, minimal input lag, the ability to handle large battles. Sometimes getting games on this PC is kind of a pain. For Stick Fighters Brawl II, because this PC cannot access Archive.org where the game is hosted now, I literally had to transfer the hard drive to my main Desktop and load the game files there manually. I could have used a CD-R, but I don’t have any with me, and the main computer no longer has a CD drive. Also, with older CD ROM drives, they aren’t always guaranteed to read CD-R disks. I remember this one having trouble with it. Also, modern computers can’t access this PC via network. Perhaps I haven’t read up too much on it, but honestly, I don’t think I really want this thing connected to anything. I’m not too bothered that I can’t really browse the internet on this machine— I have more machines that can than I know what to do with. But, I only have 1 machine to natively play these kinds of games. So, it’s been 18 years since I bought this computer. It has followed me through 7 different moves to 4 major cities. Fun fact: your skin turns over every 27 days. It’s been more than 6500 days since I first bought this computer So my skin has turned over 245 times since My outward physical appearance is literally different, 245 times since I bought this computer. No matter the changes in me as a person, this will always be my PC, from 1999.